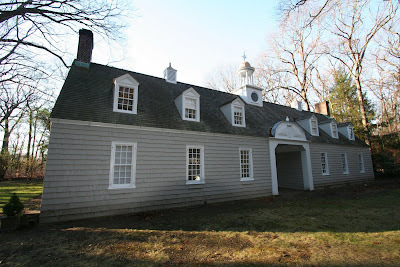 The carriage house/garage to 'Easton', the Evelyn Marshall Field Suarez estate in Muttontown. Click HERE for more on 'Easton'. the carriage house is much nicer than the current incarnation of the house. are the two wings attached to the house or are those just brick walls between the house and the wings? They were/are breezeways that would have led to doors. I always appreciate your showing auxiliary buildings. They are so important in the total appreciation of an estate. Keep up the excellent work. Unfortunately you have some incorrect information regarding "Easton" the main house had to be demolished as it burned shortly after it was purchased by very close friends of my parents. The Halls slowly and lovingly turned the adjoining servants' quarters into very lovely living spaces for them and their two children. Our family as well as others spent a lot of our summers swimming in that great pool. Each spring we would go out and patch, paint and get the pool ready for the summer. The side portions of the "bathouse" were not guest rooms but changing rooms for swimming and tennis. I learned how to do both here. You have left a tremendous gap out of at least forty years. If it hadn't been for the Halls, this wonderful place would surely have become a subdivision or worse. Iwill say that somebody definitely did not do their homework when replacing the main house. There was a mural in one of the servants' or guest houses depicting the front view of the house. place and I am glad to see that it is still intact.